Thank You all so very muchly for your lovely entries to our challenges and your continued support of us. We hope you enjoy the challenges as we can be a bit challenging sometimes! Without further ado here is the Winners Catch up for our Spotlight on Digital Plus, Challenge 33 Stitching and Spotlight on Dry Embossing. I am still waiting for the winner of Challenge 32 to come forward so if she doesn't byWednesday I will have to redraw sorry! 10 - Julie Well Done Julie, please contact me to claim your prize of 5 digi stamps from Stitchy Bear Stamps! 25 - Annette Well Done Annette, you have won 3 digi images of your choice from the Eiglas range of Digi Stamps! 101 - Vicky Well Done Vicky, you have won a £10 voucher for Joanna Sheen's online shop!! Well Done Ladies, please grab your well deserved Top 5 blinkie above! 6 - Janice Well Done Janice, please contact me to claim your 5 digis from PRAIRIE FAIRY! Good Afternoon from a chilly UK! How are all the Christmas cards coming along and are you starting to panic yet as its nearly December! Thank You for your beautiful entries for the card & matching gift challenge, so inspiring! We are sponsored once again by our regular sponsor JOANNA SHEEN who is offering a £10 voucher to her excellent online store. Check out her latest products including the stunning Enchanted Dreams CD and Enchanted Forest rubber stamps (Oooh fairies! I know whats on my xmas list!) Please do pop over and check out her shop as there s something for everyone! Onto what the girls have made for this challenge, well done ladies they're gorgeous! Inspired by a blog called Simplicity (and the fact that I haven't started my Christmas Cards yet!!!) I decided to go for CAS with my cards this year.﻿ I used stamps from Elusive Images and stamped them with Brilliance Pearlescent Purple, adding a little bit of matting and layering and, of course, bling to my star. I knew that apart from making something Christmassy a box would be perfect for this Challenge! So I decided to make a wee Silver Wedding Anniversary box! I used plain white card for the base and loads of silver tones for the layers! All the embellishments are handmade, with added printer verses and lots and lots of glitter and wee flowers. Whenever I'm limited for colours, my mind turns towards punches, die cuts and embossing. I started by using the Craft Tonic border punch system with both scallop and a snowflake punches. 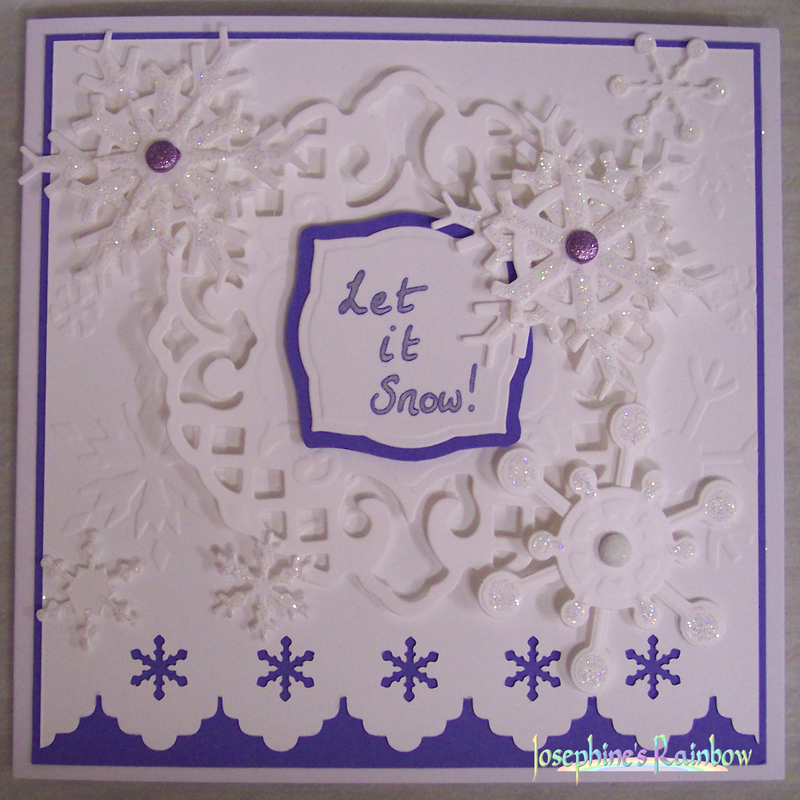 Then, I embossed the white card with a Papermania snowflake embossing folder in my Wizard before matting the result onto my 'splash' colour. 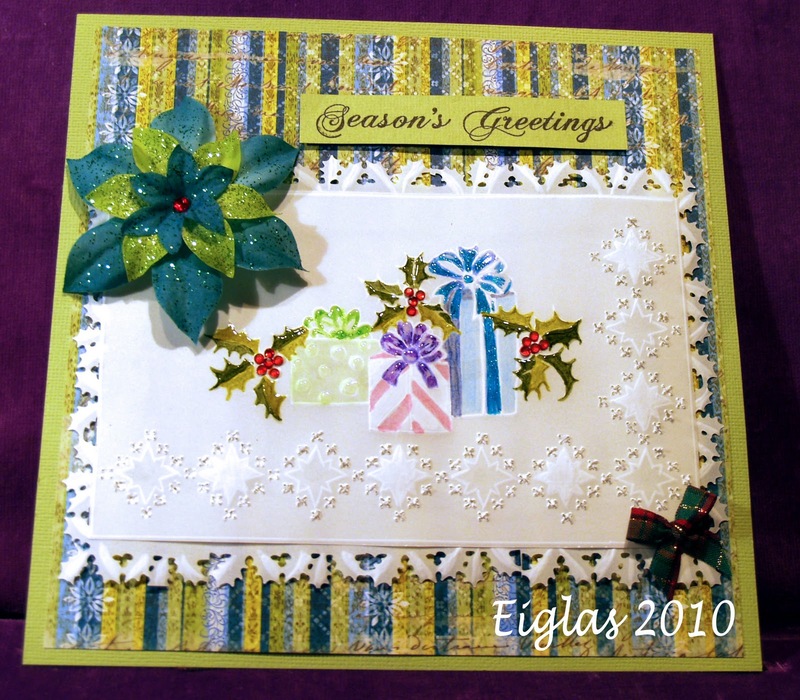 I added die cuts from Spellbinder's Lattice Medallion, Labels Three and the large snowflakes. I also cut some small snowflakes using a Cuttlebug die. I hand-wrote the sentiment and matted it on a further bit of the 'splash', glittered and layered the snowflakes and finished with some sparkly brads. For this challenge of white with a splash of colour I have used a very pale blue. This is a large card at 8" square and the starting point was the word 'snow' which is a Christmas tree decoration from ASDA. It is very textured and had flat white sequins which you could hardly see so have been covered up with bling :) The blue card has a punched border and a strip of metallic trim ribbon. 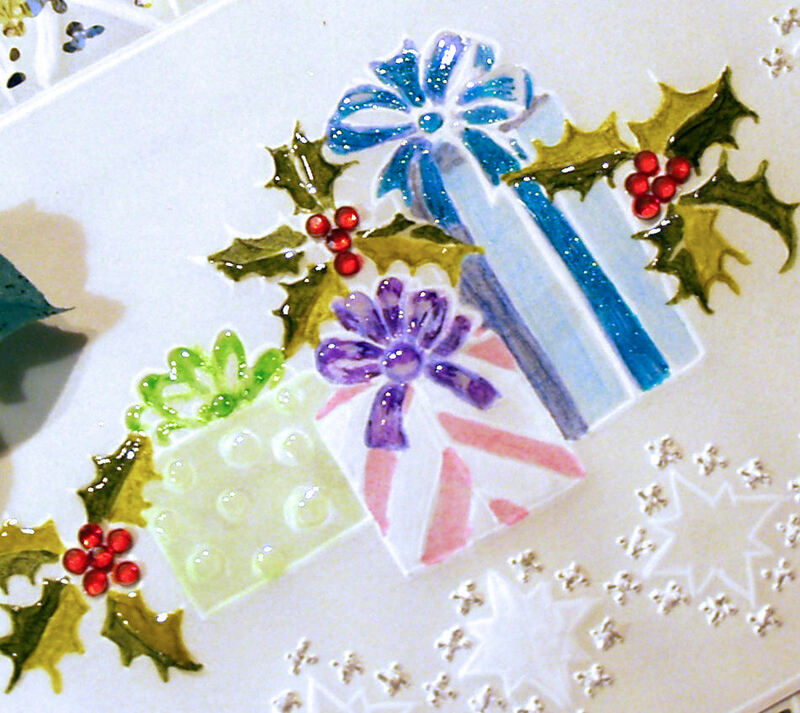 The snowflakes are from Craftime and the card is finished off with loads of Card Candy. Wintertime is a really easy time to do white with a splash cards don't you think? 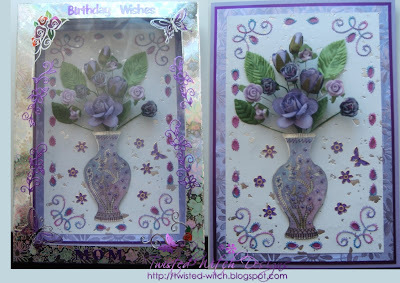 This is a card I have made for my mother-in-law whose favourite colour is lilac, so that is the splash I have used. 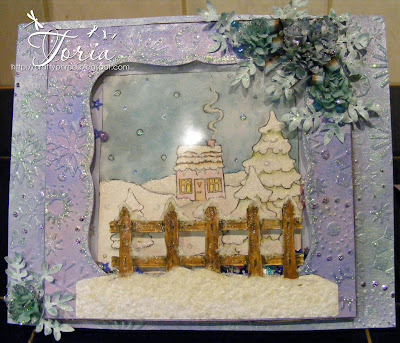 I stamped acetate with Funstamps - Let it Snow stamp using white stazon then cut it with my deckled rectangle nestie, then cut a slightly larger one with lilac paper and stuck it on with a touch of tacky glue. A lovely piece of purple ribbon from stock backed the topper and then I decorated with some die-cut corners and punched snowflakes. Simple, but very effective I think! Please note we have a new linky as froggy is starting to charge so please click the link below to enter on the new linky tool. If for any reason it's missing please leave your entry details in the comments field. Thanks for playing and good luck! Woweeee thank you so much for your fantastic entries to the spotlight on dry embossing, what beautiful work and fantastic ideas! We'll be doing a winners catch up post late this week. Please also check the previous winners catch up as a couple have yet to be claimed! Our spotlight for the next 2 weeks is on Containers and Fancy envelopes. Basically something you put something into so if you're thinking of entering our card and gift challenge which still runs for another week and you make a container for your gift or box for your card too then enter into both! Any kind of box, container, wallet, jazzy envelope etc counts so long as you put something in it. We're sponsored by Crafts & Me for this challnege which is an online store selling a huge variety of stamps and cardmaking accessories. Crafts & Me have their own range of stamps including those by artists Sara Burrier, Molly Harrison and Hannah Lynn with more to come plus a wide stock of other stamp brands by Sweet Pea, Whiff of Joy, Lilac Lemon and tons more, take a peek as you won't be disappointed! 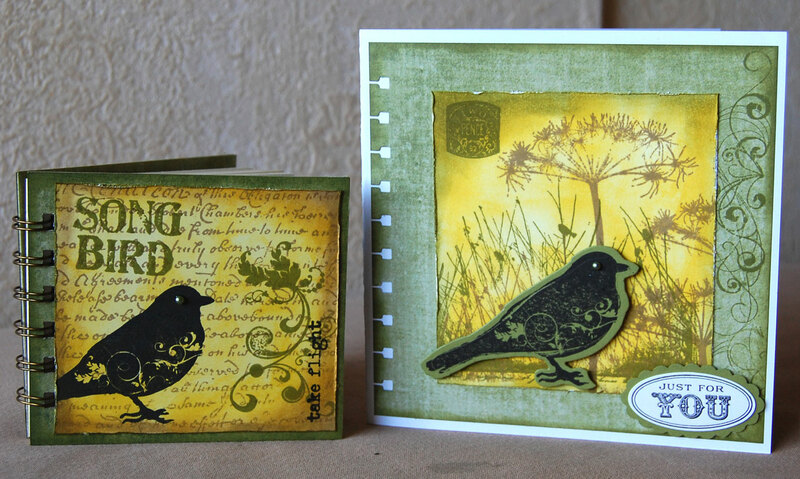 They are offering the winner one of Sara Burriers delightful designs "Day of Joy" - Thank You Teresa! Onto what the girls have come up with for this challenge! This is a boxed card I made for a work colleague of my Daughter to give to her Mother. Unfortunately the box itself is made of floral patterned silver mirri and therefore it was a nightmare trying to take a pic of it. I made the box using one of those mulitboards with a side for boxes. It is just a shade under A4 in size as obviously I needed to make the box from an A4 sheet. I decorated around the edge of the acetate with silver peel offs, which I coloured purple to match, and some lovely acetate stickers which I had in my stash. I tried to take a pic of it on it's own but it seemed to glare even more as it has an acetate inner to the box lid. The card itself is stitched both on the vase and on the background of the card. I've used a downloaded template from The Cutting Cafe to make a little stack of boxes. I printed the templates directly onto the spotty cardstock, cut them out and made up the boxes. 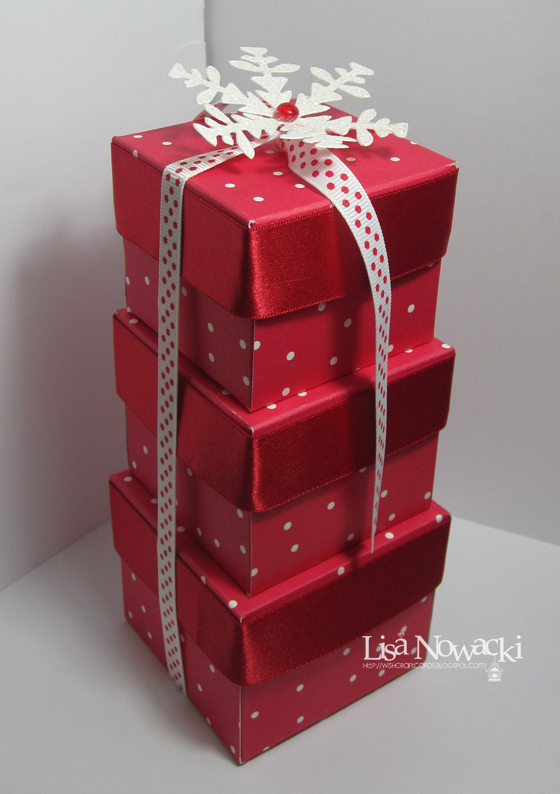 The lids are trimmed with wide satin ribbon, spotty ribbon wrapped around the 3 boxes to keep them together. 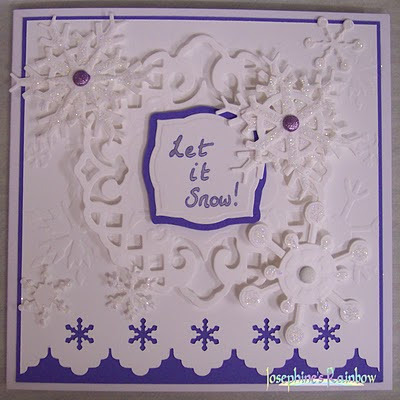 Finished off with a big snowflake cut using a Cuttlebug die, covered in glamour dust with a red dew drop centre. I love making boxes and other containers to put things in! For this one I used a template I downloaded from a place that does templates for use with Microsoft Word, but bizarrely they had a section of downloadable box templates. I cut the template using a plain piece of card from stock, scored it and then added some shimmery silver material which is like a cross between a fabric and a paper. I used a piece of card which I had stained ages ago with starburst stains then never used, so I stamped it up with some snowflakes, embossed them with white powder and cut them to size so they were a little smaller than the triangular flaps on the top. I then punched holes and used some matching eyelets and held it all together with some pale blue ribbon, ended with some snowflakes punched from the offcuts. Inside 4 iceblue tealights. Good Afternoon! I hope after the recent gales and rain the weather is looking a bit better :) Christmas is fast approaching, well its coming at breakneck speed so to help you prepare our new challenge will be one you can tick off the to do list. Firstly though a huge thank you for playing in our stitching challenge, you're a creative bunch, I wish I could use my machine better! The winners will be announced in the catch up post in about a week. We also have a new teamie - WELCOME/WELKOM SARAH! 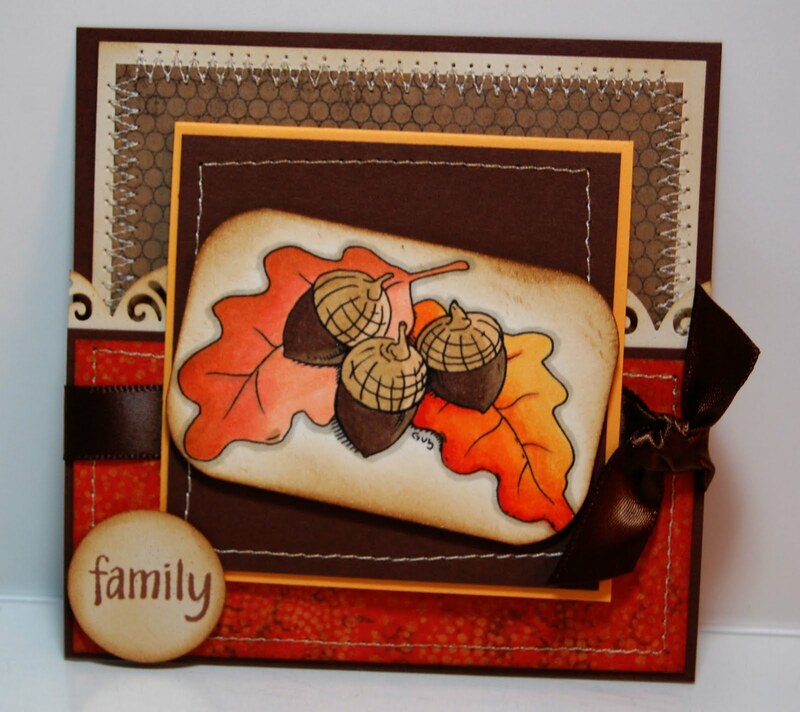 Sarah is quite a newbie cardmaker, she likes dabbling with messy things and colouring in! Sarah's also quite new around blogger and has been entering challenges along the way so a warm welcome to her! We also have a guest desgner join us - Hope Jacare (Claire) so welcome also! Our new challenge is to make a card with a matching gift, the gift can be absolutely anything handmade so long as it matches the card, not just xmas either! Don't forget we always have 2 challenges open and our spotlight on Dry Embossing is still open for another week with a fab prize from Prairie Fairy on offer so if you use dry embossing you can enter both, remember to add both links though. Lets have a look at what the girls have come up with and hope you can join us too! Here’s a card and matching tealight luminaire I have made. Red is my favourite colour for bits and bobs around the house so what better time of year to indulge myself. I used some papers which I downloaded as freebies a while ago to decorate my foldy card and a lovely decoupage fairy I bought offline. The flowers on the card and the luminaire are white Color Me Crazy flowers bought from Hobbycraft and coloured with promarkers to match the paper which is done with Starburst stains Holiday Wreath colours. The butterflies on the sides of the luminare are punched using a Sizzix paddle punch and then a piece of amber coloured floral vellum backed to it on each side so that when the battery operated luminare tealight is switched on it glows and flickers. .....great minds think alike, it would appear, for both myself and our Guest Designer, the lovely Hope Jacare (Claire), have independantly made a journal/notebook and card, albeit in very different styles! Mine is a Christmas themed book made with my BIA. 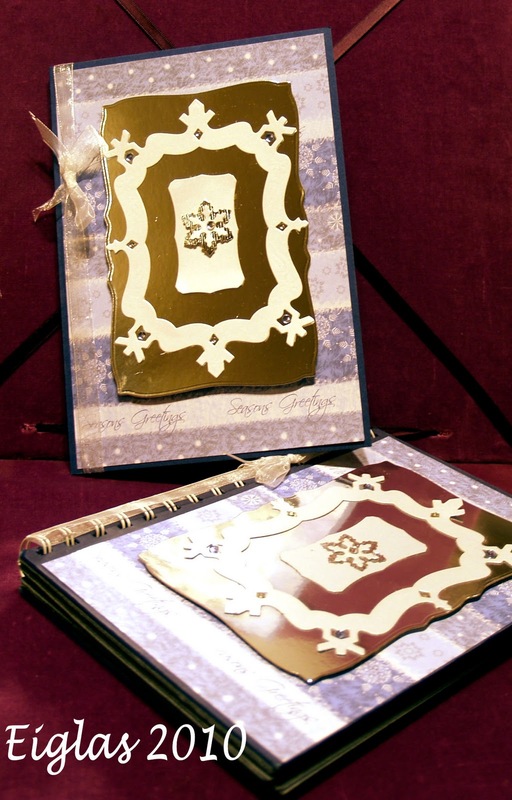 The inner leaves are also denim blue and interleaved with glassine, so it could be used =for photos as well as journalling. The face-paper is Papermania Winter Wonderland and the mirri board and pearl card overlays cut with my Nesties. My sister has a 'big' birthday coming up, and, and I decided to make a keepsake gift for her. The box is from Hobbycraft, and I stained it with Moonglow Moonshadow Ink in Ethereal Emerald before adding the photos and then varnishing. I dipped some flowers in the same ink solution, and when they were dry, I sprayed them with Crafter's Companion Spray and Shine before attaching them to the box. 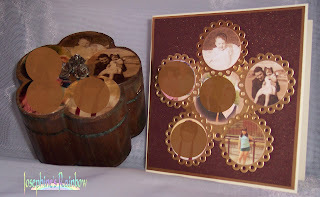 The card mirrors the shape of the box, and I used my plain and eyelet circle nesties to cut the photos and mounts. I've added an extra layer to the photo to keep it fairly anonymous for online purposes. I decided i wanted to make something a wee bit different for the challenge this week, so after having a good wee look through the net I came across this wee Stationary box! 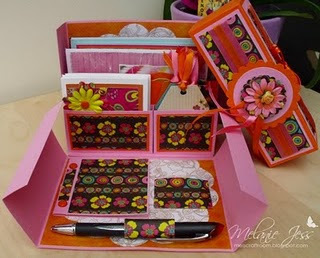 I made the actually box from 12x12 card from my stash and all the the other elements are made from the Prima papers. I've made wee cards to match plus note cards and tags for the wee kit! I'll be making a few of these for Christmas gifts this year! Check out my wee blog for more pics. 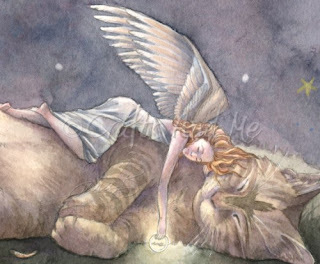 The image on the card is from Prairie Fairy Designs called "The Urge". Enough said!! haha. I used a different image on my little 'peek-a-boo' gift box, but you'll have to pop over to my blog to see it (& the gift inside). I used a half a doilie & 2 half scallops to add some layers....and many, many pop dots later.....here you have it.....a perfect birthday gift set! I made my little notebook as the gift, first cutting plain chipboard for covers and then cartridge paper for the inside pages, I then covered the chipboard with a neutral patterned paper and used distress inks sponged around the edges. I then coloured a piece of white cardstock with distress ink and stamped the script as a background. 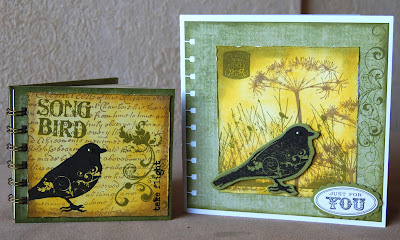 The bird, flourish and word stamps are all from PaperArtsy Hot Pick 1005 and they were stamped also with distress inks. I then bound it together with my Bind it All. For the card I used the same patterned paper again inked around the edges and used a Stampin up punch to give it the notebook style edge, this time I used a PaperArtsy die to cut the bird shape and then stamped the image. The sentiment is from Stampin Up. OOh, I really enjoyed this challenge. I started with the clock which was made from a chipboard shape and clock bits bought from Hobbycrafts at the NEC. I saw the 12 scallops and could see clock numbers in flowers and it went from there. Papermania Woodland Folk papers, lots of flowers and bling and some gorgeous embroidered leaves ribbon picked up on my travels completes my lovely gift & matching card. I was thrilled to be invited by Ei as Guest DT this week. I am Claire aka Hope Jacare and papercrafts are very much a part of my life. Originally I come from a textile background with a B.A. hons in Design from The Glasgow School of Art. I worked within the feltmaking, fashion and Knitwear industry before opening my own gift shop/Gallery "Scoskie" in Largs, Scotland. Since then I have had 3 children - Jacob, Caleb and Hope and no longer have my shop. I have a pretty hectic life that squeezes in as much cardmaking, drawing and papercrafting as I can. Last year after a lot of encouragement in Blogland I started selling my doodles and I love seeing projects that others make with them it gives me a huge sense of pride. My only tip to card makers is to work in a clean enviroment...there is nothing worse than a beautiful card with a big dirty fingerprint on it. Lol. I wish I had more time to blog hop as there is such a wealth of talented creative people out there and I love going looking at new blogs, it opens your mind up to so many different possibilities...and lets face it we all do it because we love to create! We're now open for another spotlight but before we do we have a plea lol! Please check whether you have Word Verification swithed off on your blog as it really slows the girls down leaving comments. I surf via blackberry and whenever I get one with word verification it logs me out without saving what I've just typed and I know other team members here and on other DT's have similar problems. You can simply change to comment moderation by clcking on your blog SETTINGS then click COMMENTS then scroll down to COMMENT MODERATION and click ALWAYS. In the box below that says SHOW WORD VERIFICATION click NO. Right-O! Our new spotlight for the next 2 weeks is DRY EMBOSSING. I wonder if any of you are brave to use your old brass stencils! We are sponsored by Prairie Fairy Designs who are offering the winner a choice of 5 of their digital stamps!! Hello! I am Roberta from Prairie Fairy Designs. I am a digital stamp company featuring artwork not only created by me but also my two kids, ages 9 and 12. They are featured on the site as the Fairy Princess and the Prairie Prince. I have been an artist for as long as I can remember and have always loved to create. Two years ago my sister-in-law invited me to a rubber stamp party. I laughed and said "Maybe I will buy something if I can use it to stamp on canvases.". Needless to say, I was hooked! Two years later, a lot of learning about computers, and a few setbacks with web stuff (I am so not tech savvy!) I finally accomplished my goal. We have been around since the spring and still growing. If you have any questions about going digital, check out the site and the Prairie Fairy blog for more information, tips and tutorials. So head on over to Prairie Fairy Designs and check it out! Thank You Prairie Fairy for your generous sponsorship! Lets have a look what the team have come up with! I've been very remiss lately and actually had to remove a spiderweb from my embossing box! That's how long it is since I've done any embossing LOL! So I was very pleased that the theme chosen this week is Dry Embossing - it got me back actually using this lovely, if sometimes tricky, technique. I could have got the Big Shot out - I've just bought Tim Holtz's embossing folders - but I thought I'd have a go at the original technique on vellum with a couple of ball-tools and I've also added some paper-pricking too! The backing paper is K&Co Winter Wonderland and the flower is Petaloo from 'Across the Sea' set. The colouring is with Copics and the holly leaves topped with glossy accents. Red adhesive gems were popped onto the berries to give a little accent. The holly border is Martha Stewart and I've embossed some leaves too. 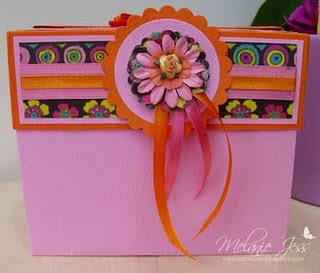 I decided to show off my Cuttlebug Embossing folders for my card this week and I managed to use 8 of them! First I stamped some white card with a flower (free from Craft Stamper) in Dried Marigold Distress Ink. I ran 8 pieces of the stamped card through different embossing folders and then punched out 1" squares from each piece, then I added an un-embossed 1" square with the sentiment, and stuck all the squares in - well - a square. I'll put some close-ups on my blog. Two different techniques of dry embossing here. 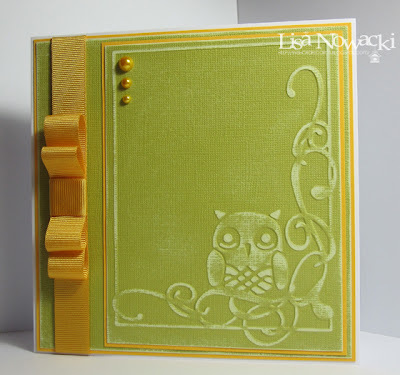 The background sheet was embossed (and debossed) in my Wizard using two Cuttlebug embossing folders - Swiss Dots and one of a range of border folders. The card is a mirri-silk type that shows the embossing really well. The main flower and white background were embossed using a Glitter Girls board - can't remember the name of it, but it's the teal one! 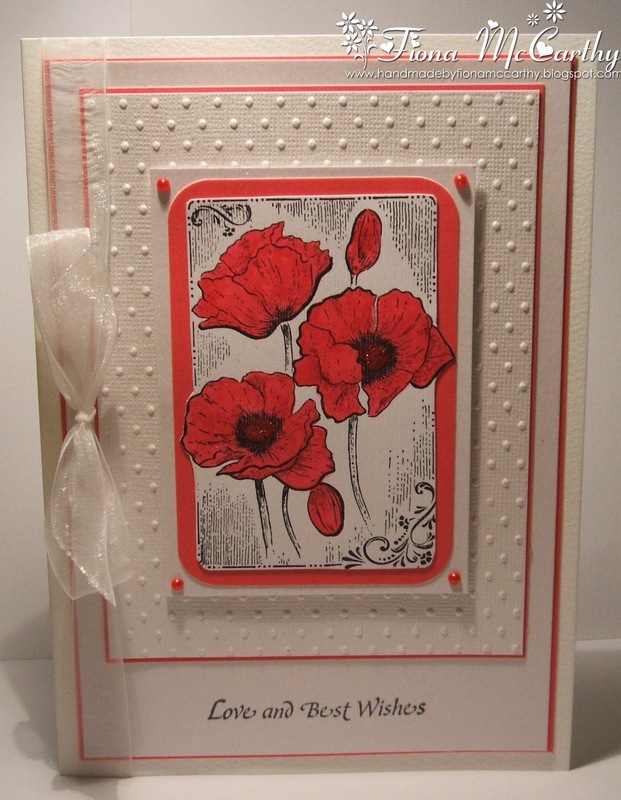 I picked out the embossing with glitter, and finished the card with a couple of silk flowers and a brad. 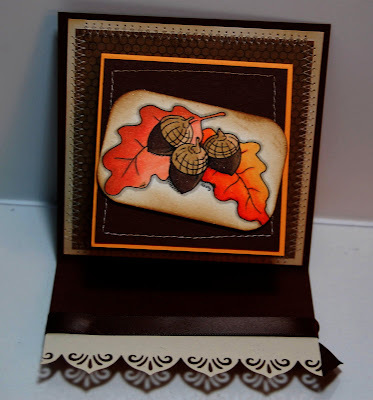 Using two different ways of dry embossing, this is what I came up with for this week's Spotlight. I used a Sizzix Snowflake Folder for the red background and then I used my Ultimate Pro for the sentiment. I am not happy with my bow despite using my Pro to make it but my arms and fingers are playing up again! But this one is for a man so he won't even notice the bow is bowed!! I've used a Cuttlebug owl embossing folder that I'm ashamed to say has never been out of the packaging until now! I've embossed the owl onto coredinations card and then sanded it back to bring out the design. Yellow cardstock, ribbon and pearls from my stash. For this card, I started with starburst stains and other mica powder sprays and put them onto a sheet of acetate. I then used a brayer to transfer the colour onto the snowflake embossing folder, which I then rang though my cuttlebug. I allow the paper to dry and then added my micra powder to highlight the embossing and to further highlight I added stickles. I used a nestie to cut the window out. 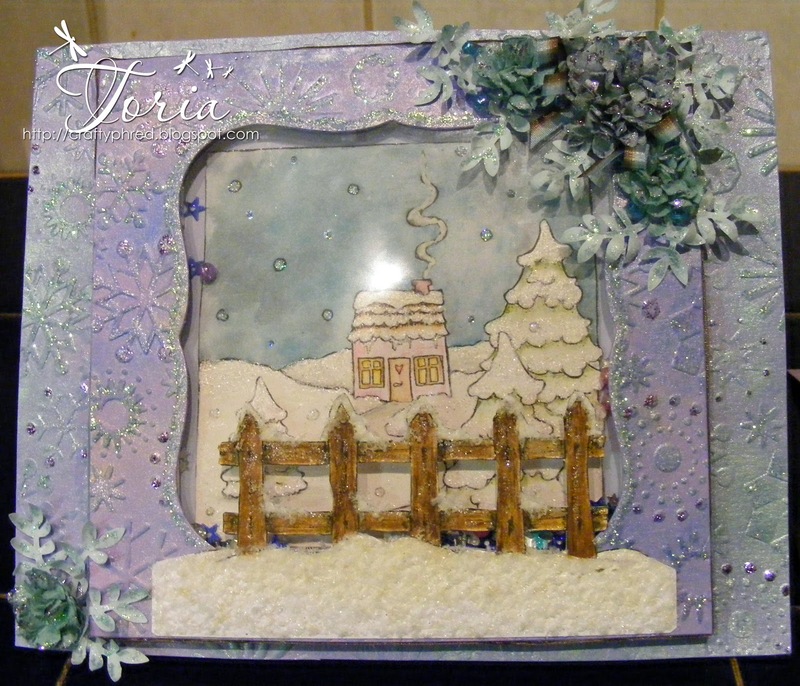 The images are magnolia - Winter day scene and the snowy fence. Which have been coloured in a combination of copic's, distress inks and Inktense pencils. I added flowersoft and stickles to them as well. The flowers are paper flowers that I layered up and then used the scrunch technique to create the effect I wanted. I sprayed them with water and then added micra powder to them. Once dry I added stickles to them. The leaves are created using a punch and then I have added more stickles to them. Good Evening all! I hope you're enjoying the fireworks and if you're out tonight wrap up warm as its freeeeeeezing! Its time for our winners catch up so thank you all for playing along, it really does get harder to choose the Top 5 each time as you're all just so talented around blogger! I shall start with the wnners for Challenge 31 - Step away from the Square sponsored by Joanna Sheen and you certainly did step away from the square with ease! The Winner of a £10 Joanna Sheen voucher is.... 62 - Paola Levi Well Done Paola, please email me your details to claim your prize! ﻿Well Done ladies! Please grab your Top 5 blinkie above! 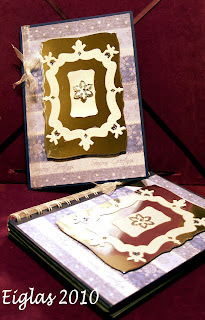 Winner of the 2 books by Crafty Individuals is.... 81 - Dawn! Well Done Dawn, ple﻿ase contact me to claim your prize! Congrats ladies! Please feel free to grab our Top 5 blinkie above! Its time for another challenge here at Crafty Cardmakers but firstly wow I cant believe how many freebies there are to be had so thank you so much for your entries! Winners will be announced in our catch up post this week. There's also still time to play in our 'Digi Plus' challenge which you'll find here. Our sponsor once again is the delightful JOANNA SHEEN who is offering a £10 voucher to spend in her store which is jam packed full of goodies and she offers FREE postage & packing worldwide on most items (£5 min order) Go check her out if you've not been before! This is a really quick and easy card. I used a red base card and added some gorgeous glittery MME Wonderful Winter DP. My sentiment is from Craftwork Cards edged with red Promarker and then a Sakura clear glitter gel pen on top. The image is a die cut from LOTV (so no colouring) with added glitter gel pen. Snowflakes are from a Martha Stewart punch and the swirls are from Cottage Cutz. Snowflakes and swirls finished with Glamour Dust. And that's it, just a few minutes and you have a Christmas card. This one was so up my street. I just love embroidery on cards and was my first love in card making. To be able to now combine it with stamping makes my day! Easily pleased, lol. I would do more but it takes so long. For this challenge I printed the stitch pattern onto copier paper and then placed it over the card I wanted to stamp on and pricked through. Then I stamped the Kanban Annabel or is it Lucy? stamp between the two rows of pricking. I coloured her in with promarkers and then chose my threads to match the colouring. After I had stitched I added some gems into the circles of stitching. I made the embellishment from a couple of different threads and some flowers and a heart pin. I decided not to use any decorative papers as I felt that the stitching was enough of a statement and looked better on plain paper. This card is very different from the norm. 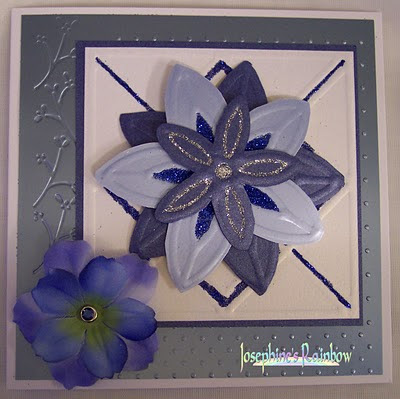 I found this Joy fold card ideal at splitcoast stampers you tube site. This card has tons of stitching, and I had a lot of fun with it. The orange part of the card with the acorn stamp opens up for you to write in. The stamp is from Copicscrapbookmarkers and I colored it with Copics. Like Melly & Fiona I have gone for faux stitching on my card - getting the sewing machine out requires major disruption and unfortunately I didn't have time for that! I drew a line of zigzag stitch down the left hand side of my card with a fineliner, then on my next layer of patterned paper I used a paper piercing tool to make holes all around the edge then added 'stitching' with a white sakura pen. I repeated the process down both sides of my mounted image and this time used the fineliner again to create the impression of stitches. My image is from Pollycraft and has been coloured with Promarkers. I wanted to keep this one simple so only added hand-stitching to the computer-generated sentiment ~ "Follow your dreams for they are the hope of the future" ~ perfect for my daughter who has just been offered a place at Uni to study Nursing . Using a gorgeous Sarah Kay image coloured with Promarkers, I distressed the edges very lightly and layered her onto fabulous DP from Bearly Mine. I SO fell in love with those papers! For my wee card I wanted to keep it simple and stuck with 2 colours! As I don't have a sewing machine I used my sakura white pen to add all the faux stitching, used a wee Lili of the Valley Christmas image coloured with promakers, loads of added glitter and gloss for the ice! Some wee embellishments from my stash finish my wee card. For my "Stitching" card, I decided to use faux stitching (well I didn't have much choice as I don't have a sewing machine! lol) I have used a digi stamp from Di's Digi Downloads, coloured it with ProMarkers and used a fine liner black pen to draw on the faux stitching. The papers I have used are from Craft Creations.I have also added ribbon and peel offs from my stash. I don't make enough boy cards. So I decided to start making more & I even used some stitching on it. A fancy little 'X' design along both sides, with a straight sewn line down the other 2 sides. Image is a hAnglar-stAnglar & I love them because they have little faux stitching marks all over thier clothes (click image for closer view). I used my long lost chalks to create a faux sky & faux road by using a Q-tip to spread the chalk around. I also freehand faux stitched around the sentiment. For the stitching challenge I have done some real stitching on a card. The main starting point was the 'Grandma' panel which I have recycled from a shop bought card. The stitching was already on the panel and it is a very pretty starting point. I just matted it onto a darker purple card to provide contrast. The pre glittered backing paper is Papermania Henbury Lane and I stitched 2 of the matching felt butterflies together and stitched them onto the card. By folding the top layer wings it shows off the 2 colours of butterfly really well. I pricked a few trails onto the card and stitched using the metallic thread, adding a few gems for bling. Over to you now! The challenge runs from 12pm 1st Nov to 9am 15th Nov (GMT) All entries must be new, no backlinking to posts made before the start of the challenge. We accept a maximum of 3 entries per challenge and they can be any handcrafted item (Cards, scrapbook pages, altered items etc) so long as it meets the challenge requirements. Please post your entry into the froggy link below linking to your blog post.